Although Appearance of Windows Vista is good but I prefer Ubuntu look n feel because its light, simple and elegan. For the everyone that using Windows XP and bored with look n feel of your windows desktop, You can make your Windows XP appearance like ubuntu dekstop. To make Windows XP desktop look like Ubuntu desktop there are some components must be altered, among other: icon, themes, cursor, welcome screen, boot screen, etc. If your interested to change appearance of your Windows XP become ubuntu, follow the following tutorial and your Windows XP desktop will like the following picture. To modify your Windows XP please download ubuntu customization pack and extract it. Copy “ClearLooks” folder and “human” folder to “X:\Windows\resources\themes\”. Select appearance tab, choose human or clearlooks in the windows and button then click apply. Goto extracded folder and then open “xFree Cursors” folder. Right click on install.inf file then select install. Open Ubuntu Icon then install Super Turbo Tango_Patcher 7.05 by vertigosity.exe till finish. 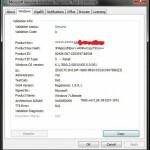 Note : this program in Avira antivirus detected as virus. If you use avira as antivirus, disable the avira before install it. Install “UbuntuHumanlogon.logonxp” in the welcome scree folder. You can use “style xp”, “tune-up utiliti” or ohter to install it. To install boot screen same as installing Logon screen. Right click mouse on scree saver file in the “Ubuntu Screensaver” folder and select install. Copy the sounds in the folder “Ubuntu Sounds” to “windows\media\“ folder. Goto control panel and choose the classic view and then click the sounds and audio devices and then click the sounds tab. The filenames are self explanatory to the windows systems sounds and it should be easy for you to customized. Lclock : Install Lclock till finish and then copy all file in the “Lclock skin/ubuntu look” folder to lClock installer folder and then reload Lclock. 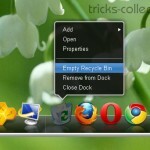 yodm3D : change this software to make your desktop become 3D. 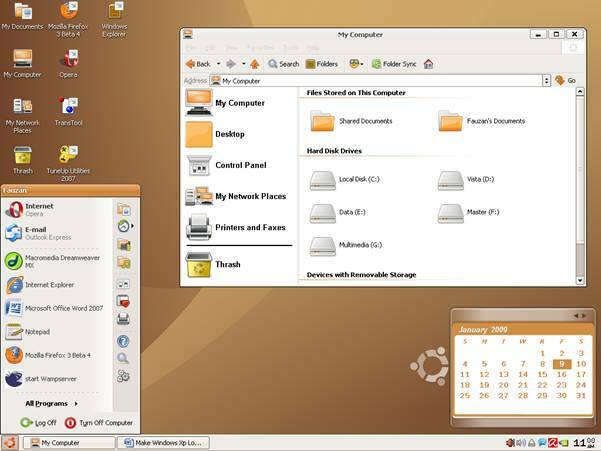 Click Here to download Ubuntu Customations Pack. Related to "How to Make Windows XP Look Like Ubuntu"